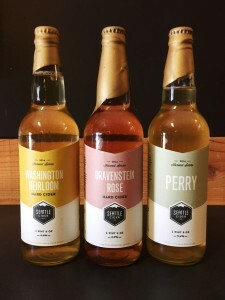 SEATTLE – Seattle Cider Company is excited to announce the release and expansion of its limited edition ‘Harvest Series.’ Introduced last year with the release of the award-winning Washington Heirloom, this year’s Harvest Series will also feature limited releases of the growing cidery’s Gravenstein Rose and Perry. Handcrafted at the cidery each fall, Seattle Cider Company cidermakers carefully press, ferment, and mature the ciders in the Harvest Series to feature the distinct aromas and flavors of Washington-grown fruit. With a launch party scheduled at The Woods tasting room on May 2, these limited edition ciders will be available on shelves throughout the greater Seattle area beginning May 4.